Going around the new K11 (a.k.a. “the world’s first art mall”) mid-afternoon, I stumbled upon a line forming in one of the almost hidden basement corners. Finding out it was a Chinese restaurant I fell in line just the same for some post-lunch lunch. I wasn’t really hungry. I suppose it was more out of curiosity that I lined-up as I’m sure all the locals and Mainland China folks in queue were on to something good. And I was right. Xia Fei is a Shanghainese skewed handmade noodle and dumpling house that also serves some pretty authentic ala carte dishes. The first thing you’ll notice going inside is the open kitchen where line cooks stretch out dough into edible threads and pleat sheets of flour into perfectly shaped dumplings. There were spicy minced pork noodles and scallion pancakes and braised eel along with lots of other interesting stuff on the menu but I decide to order some light items. First up were the mustard cress and diced bean curd wrapped in bean curd sheet. 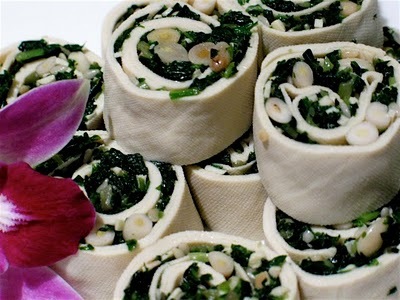 It was served cold and the greens and crunchy pine nuts inside the bean curd roll proved to make a very refreshing starter. Very mild tasting. 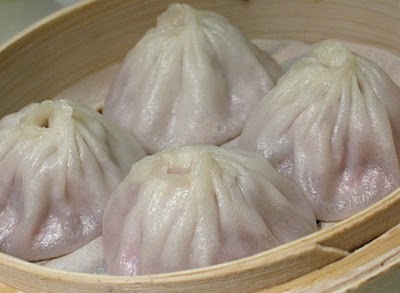 The xia long bao was very good as well. Soupy and meaty on the insides and served incredibly hot out of the steamer. Daresay comparable to that of Din Tai Fung’s? But I suppose it loses out in terms of quantity per basket. In any case, I’d just order several baskets of these and I’d be completely happy. 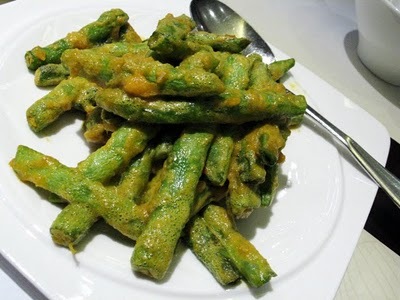 What I liked best among the random picks was the deep fried French beans with salted egg yolk. Which is exactly what’s advertised; deep fried long green beans tossed with a sauce made with tons of salted duck eggs. I slathered the yolk and beans in my bowl of steaming white rice and had a greedy mouthful. Then I think I gave out an involuntary sigh. 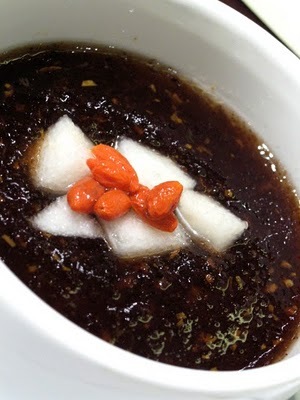 For dessert I had the Chinese herbs in sweet soup. Now this was interesting. It was cold and had the texture of mashed jell-o. It had this medicinal aroma that was not in any way off-putting. In fact I really enjoyed it. Considering I didn’t recognize a single ingredient that was in it. A nice revitalizing end that also cleansed and soothed the palate. I wouldn’t categorize Xia Fei as a chichi restaurant of the moment. Nor do I think it tries to project itself to be. But it’s definitely the type of place you go to to get good, old fashioned, standard comfort food at very democratic prices. Which will make the lines at this place a constant. I have my eye on those huge noodle soups with the menacingly red chili oil for my next visit.